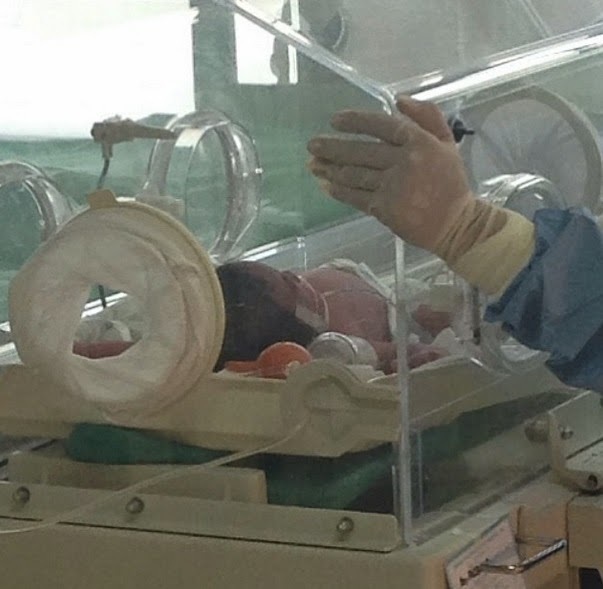 Manila, Philippines - Jinkee, the wife of Pinoy boxing champion Manny Pacquiao gave birth to a baby boy named Israel via caesarian on Sunday afternoon, April 27, 2014. The politician couple welcomed the newest member of their family and their fifth child. "Baby Israel Pacquiao was born at 3:22pm and weighed 8 lbs and 1 ounce. He's 2 weeks premature but doctors say he's a healthy baby!," Mark Zambrano of GMA News posted on his Instagram account. Zambrano reported around 2:17pm today that Manny Pacquiao followed his wife into the operating room for her first C-section birth. He posted also on his Instagram account a photo with Manny Pacquiao giving a thumbs-up after seeing Israel in the incubator. Earlier, the boxing champ posted on his own Instagram a photo of him saying a prayer for his wife before the Caesarian delivery. "Please pray for my wife as she is having our baby boy Israel in just a few hours. ", Manny said. The Pacquiaos have four other children: Emmanuel Jr., Michael, Princess, and Queen Elizabeth.